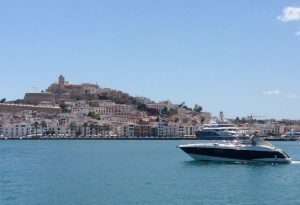 Ibiza Town is an exciting place to be in the Summer. The nights are long and the parties vary from a group of people dancing in the streets to create business for one of the famous clubs like Pacha, through to long dining tables in the narrow streets filled with diners having a great time. The town has a completely different feel in the Winter months. The sun still shines and the locals enjoy a large choice of local cafe’s and restaurants. There are many boutiques to spend a few hours in. Marina Botafoch and La Marina are home to some very large motor yachts. There are some very smart restaurants and clubs where the celebrities spend time.